We talk about the cordless job site pretty frequently. But how can cordless tools replace corded tools? The math doesn’t add up, right? Actually, it does. As manufacturers push into more powerful cordless tools, the concept of switching out your corded tools without power trade-offs is compelling. …and we can keep going, of course. Any cordless tool producing 15 amps can’t possibly be as powerful as a 15-amp corded model. There must be something more. Cordless Tools Produce More Current! So how can cordless tools replace corded tools and have the same power capabilities? They produce more current. Much more. Running as many as 100 amps to power a tool seems awfully high, but that’s exactly what’s going on in the battery. Notice that as you increase the voltage, the extra current you need comes down. In order for the battery pack to only provide 15 amps of current to match what you get out of the wall, it would also have to be wired for 120 volts. Keep in mind that many manufacturers list a “Max” voltage, which is the voltage at the pack’s highest charge state. It quickly drops ~10% down to its “nominal” voltage where it operates most of the time. So, you’re looking at a tool that would be 133V Max to match the 120V coming out of your wall. In case it comes up on Final Jeopardy, that would be sets of 37 cells. 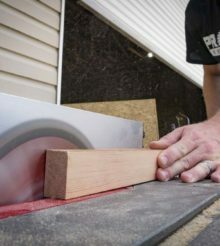 When I spoke with Paul Fry, Cordless Guru for Milwaukee Tool (my title for him, not his official one), he gave me a little more insight into how cordless tools are replacing corded tools. He said the original lithium-ion tools that came out years ago were only able to produce a few hundred watts out. With better cell and tool technology, manufacturers can now produce a few thousand watts out. The only question remaining is how to manage that kind of output with a meaningful runtime. For now, getting 1800 watts to match 15-amp corded tools is not only doable, but it’s also effective.